As if Cal hasn’t got enough to worry about, being buried alive certainly takes the cake! But his loyal friends, Winter and Boges, manage to get him out by calling Emergency Services anonymously. Cal wakes to find himself in hospital – under armed guard. The detectives believe he is a top notch liar. Cal is horrified to learn that his little sister has been kidnapped, in her comatose state. The cops think Cal has her hidden somewhere and don’t seem to care that he was nearly buried alive. Worst of all, Cal’s Uncle Rafe and mother visit him and Cal is shocked to hear his own mother plead with him to release Gabbi back to them. A damning written statement by the traitorous Enfield Rathbone and Cal’s fresh DNA at the scene of Gabbi’s abduction, seal Cal’s guilt as far as the law and his family are concerned. Cal is driven crazy by fear about his sister. He has to find her! Escaping through the air ducts of the hospital and out the front door dressed as an orderly, Cal is almost caught by police dogs, when he is rescued by ex-detective Nelson Sharkey, driving a stolen ambulance. Hiding out at Winter’s apartment, Cal tries to piece together the remaining clues. Winter has somehow managed to save some papers and it seems the truce between her and Boges is holding rather well. It becomes obvious that Cal’s twin has been used to collect fresh DNA to plant at the scene of Gabbi’s kidnapping, but who would do such a thing? Nelson Sharkey comes up with a contact: Ma Little. It’s Cal’s turn to show some initiative and barter with the kidnappers. Ma Little is a shady character and it’s a risk to come out into the daylight to meet with her. Finally Cal is given a lead to Gabbi’s whereabouts. He must talk to the strange and dubiously helpful Dr Leporello. Betrayed by someone he trusted, Cal is almost caught by the police again and finds himself chasing his twin, back to the boy’s house. Here he collects evidence, a photo of the boy, Ryan Spencer, but it is the sight of a white toy dog on a shelf that rocks Cal to the core. It is the same toy dog that has haunted his dreams. Finally a stroke of luck in the search for Gabbi. Cal spots one of Oriana’s thugs buying intravenous liquids at a pharmacy. He can’t follow on pushbike but at least he now knows who has her. Nelson arranges a handover meeting with Oriana at a deserted bridge. It is here that the worst possible outcome occurs. In her comatose state, Gabbi is thrown, sleeping bag and all, over the side and into the freezing water below. Cal dives in but cannot find his little sister. She has drowned. I found this development quite shocking, but given the surreal nature of Cal’s life, I was prepared to suspend belief. It will be interesting to see where Gabrielle Lord takes the storyline in Conspiracy 365 September. 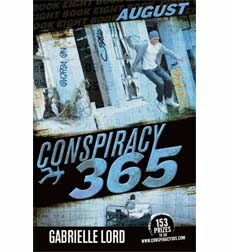 Don’t forget the fan website at http://www.conspiracy365.com/, with special members section, comment wall, online polls, game and exclusive downloads. This series really has embraced the interactive!